Sign up for our free May 3, 2018 webinar on “Q: Is There Really a Skills and Experience Gap Causing Failures in Today’s Construction Marketplace? The greatest risk of modular construction failures has been seen in facilities that are domicidal or multi-family in nature, such as hotels, student housing, senior living, and soldier housing. The living units of these types of facilities have inherent similarities: they require both an individual cooling/heating unit, bathroom exhaust, and some sort of central HVAC make-up air system. In addition, these kinds of buildings contain many more modular “boxes,” increasing the number of marriage wall interior cavities and ceiling-to-floor cavities that might not be required in other types of modular construction. The nature of modular construction makes it difficult to repair once water or mold damage is found. Sometimes the damage can be such that the modular building has to be deconstructed to remove deteriorated materials, and then re-designed and re-constructed using conventional methods. This essentially causes the advantages of modular construction to dissolve away as the building gets converted to a traditional “stick” wood-frame building or a traditional steel structure building. Those who wish to avoid mold and moisture problems in modular building design and construction should realize that it’s a perfect candidate for an outside peer review, especially in warm and humid climates. Inherently, the design and construction of modular buildings require careful interfacing between the various designers and contractors. There can often be a set of base building designers and contractors and then a different team for the modular units themselves. Achieving the correct building pressurization between the base building design and the modular unit design is an area where a peer reviewer can help the team tremendously in identifying how the modular box HVAC design will work with the base building HVAC design in order to achieve the correct building pressurization. 1) Modular construction inherently contains hidden interior spaces that make it difficult to control infiltration of outdoor air. This includes the cavity between modular boxes found in wood-frame modular construction, as well as spaces between modules found in the steel-frame modular construction. These interior cavities provide an easy pathway for air flow to not only enter the building, but also to travel long distances through the building. 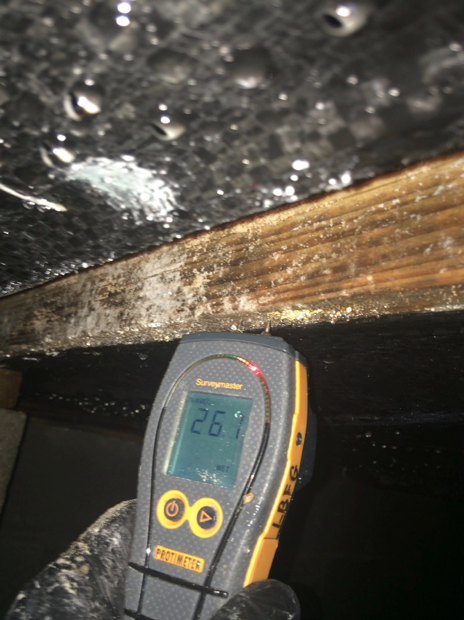 As this air travels throughout the building, it washes over interior surfaces, causing direct condensation or at least raised surfaces - conditions that have been found to cause physical damage and mold growth on wood framing and interior drywall. Figure 1: Here is a three-story modular hotel that had to undergo a complete renovation due to outside air infiltration-related mold and corrosion problems. Figure 1 shows a steel-framed modular hotel in Florida on which Liberty Building Forensics Group (LBFG) performed work. It first began to experience metal floor pan corrosion from the underside of the guest rooms because warm and humid air was traveling through this cavity with ease, resulting in condensation on the metal pan. This problem occurred on each floor of the building, not just on the bottom level. The building make-up air system was unable to fully or correctly pressurize the building because the interstitial spaces between the modular “boxes” were too leaky. Also shown in this picture is the mold damage that occurred on the demising walls between the guest rooms, at the marriage between the modular boxes. The damage on the drywall between the interstitial spaces had to be removed and the wall was then re-designed and re-built using a conventional structural design. This converted the modular structure to a more traditional structure. 2) Each modular box as it comes from the manufacturer is designed and constructed in a vacuum of the requirements for the overall performance of the building. One area that experiences serious repercussions from this fact is the HVAC system design and installation that dictates the building pressurization. The modular box that comes from the factory generally contains both the cooling and heating unit and the exhaust for a bathroom, both of which are dependent upon the separate common area HVAC system for make-up air. It does not seem to be a common consideration during the design and construction of modular facilities that the pressurization of the overall building is dependent upon the pressure characteristic of each interior space, whether occupied space or space between two modular boxes. Similarly, the air leakage characteristics of modular-constructed buildings are dependent not only upon the leakage rate of the modular box itself, but also upon the leakiness between and around the compartments that make up the building. Figure 2: The left side of this graphic illustrates the common understanding of how a modular building is compartmentalized and therefore what its pressure profile is. The entire building is considered to act as one pressure vessel. The actual process of how this occurs in the field is shown on the right-hand side of the graphic. In actuality, each module and even each interior cavity acts as its own pressure vessel. Figure 3 shows the cavity that exists between the modular units. In the case of this building, the cavity was interrupted from the ground floor to the roof. This allowed a free flow of air to move not only throughout the building but more importantly inside these cavities, resulting in both the deterioration of the drywall and mold growth. Figure 3: This is the cavity between two modular boxes. Each box has a double drywall steel stud wall bordering this space that runs continuously and uninterrupted from the ground level to the roof. 3) Modular design and construction often uses a crawl space, which adversely impacts the ability to control condensation and outdoor air flowing in and throughout the building. The crawl space can be difficult to isolate from the building cavities (including the marriage wall cavities), allowing air to flow more freely through the building. Many times the crawl space is designed by the base designer rather than the modular manufacturer, resulting in the improper design and construction of the crawl spaces for use within a modular building. In warm and humid climates, this fact has caused problems with moisture accumulation and condensation occurring not only on the belly wrap of the modular boxes, but also inside the marriage wall cavities. Figure 4: This is the marriage wall between two modular boxes in an assisted living facility in Florida. Moisture accumulation and condensation occurred not only on the belly wrap but also on the wood found in the marriage wall cavity. The photographs in Figure 4 show the marriage wall between two modular boxes in an assisted living facility in Florida. Often these cavities remain open (or at least poorly sealed), allowing for outdoor conditions to reach in and affect them. In Figure 3, moisture accumulation and condensation occurred not only on the belly wrap (see Video 1) but also on the wood found in the marriage wall cavity (see Video 2). This cavity between modular boxes is a unique condition found only within modular construction, It is a key area that must be addressed if moisture accumulation is going to be prevented in future modular construction in warm and humid climates. 4) There is a modular box versus base building conflict inherently built into how modular buildings are designed, built, and delivered. The modular boxes are designed and manufactured in a vacuum of the design and construction of the base building. The crawlspace, roof, attic, exterior cladding, and HVAC system are more often than not each designed by separate entities, and are then constructed by entirely different entities. As a result, the typical “design-by-silo” challenges inherently found within the design and construction process are accentuated to an even greater extent than they would normally be. There are now essentially at least two architects, two mechanical engineers, and two contractors on the team making decisions apart from each other about building pressurization, air barrier design, and dehumidification capacity. For this reason, many modular facilities do not end up with continuous barriers or proper building pressurization needed in a warm and humid climate to prevent moisture-related mold problems. Figure 5 shows the bottom of the third floor “pan”. This area was found to have condensation occurring as a result of air flow through the third floor pan and the second floor ceiling. The areas that had direct air flow from the room PTAC units were worse because they were found to be the coldest. In some cases, the surface temperatures were found to be as low as 68F during the summer months. Figure 5: This is the area below the third floor pan and above the second floor ceiling. This area was found to have significant condensation occurring on the bottom of the pan. This cavity was communicating freely with the wall cavity and the exterior wall, allowing free flow of air throughout these hidden cavities. 5) Inspections for code compliance often differ depending on the jurisdiction in which the individual parts are either manufactured or constructed. For example, in the State of Florida, modular construction is governed by the Department of Community Affairs. The DCA inspects each modular box before it leaves the manufacturing facility. On the other hand, the base building is inspected by the local code official.This individual does not, however, inspect the modular box once it has received the DCA inspection and certification. While both governmental agencies rely upon the same building codes, this “silo inspection” competes with a more holistic process that has overall building performance as the overarching goal - and is found wanting. George H. DuBose-CGC; Donald B. Snell-PC, Cert. Mech. Contractor, CIEC; Richard Scott-AIA, NCARB, LEED AP; and Charles Allen, Jr., AIA are all building experts at LBFG. LBFG has provided mold and moisture diagnoses and solutions for buildings to owners, contractors, and developers worldwide. The firm has project experience in the U.S., Canada, Mexico, the Caribbean, Central America, the Middle East, Southeast Asia, and Europe. Contact us at g.dubose@libertybuilding.com or by phone at +1(407)467-5518.